Many are surprised to learn that the Columbia River has placer gold. Actually, it has a lot of gold, nearly all of it being extremely fine textured. There were a fair number of placer gold mines along the banks of the Columbia River on both the Oregon and Washington side, but the river has changed significantly since the construction of the dams. Locating the black sand paystreaks will be your best bet here. You are not likely to strike it rich, but finding a little bit of gold on the Columbia River is not hard, and it’s a great way to deal with cabin fever. These deposits are widespread and can be found relatively easily in small quantities almost anywhere. The best method for locating gold in these areas is to identify black sand concentrations. These are often found in thin “paystreaks”, sometimes right along the surface of the beaches along the river. Prospecting in fine sands is one area that you don’t necessarily have to dig deep to find the gold, because the gold particles are so fine that they are easily moved by the water action. Literally anywhere has the potential to produce along the Columbia. Spotty prospecting has been done throughout the area with similar results; small quantities of fine gold with limited commercial value. Capitalizing on these fine gold deposits will require excellent fine gold recovery techniques. In many of the counties in Washington State, the Columbia River is probably the best place to search for gold. The gold occurrences in this river are almost always extremely fine. Spotty digging was done all throughoue the Columbia at low-grade deposits. 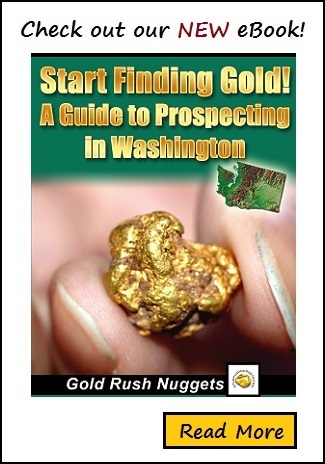 Although gold can be found just about anywhere along the Columbia River, a prospectors time may be better spent exploring for richer gold deposits that are known to produce larger gold particles. However, for many prospectors the placer gold found in the Columbia River is easily accessible and the best location to search. There is fine placer gold found all throughout the river system, although the gold concentrations area generally higher upstream than those found in the lower Columbia River, most likely due to the amount of lode gold sources in Eastern and Central of Washington. Placers are still usually lower grade than many other placer areas in the state. Many of the old diggings along the Columbia River were done by early Chinese miners who were content to work less profitable ground than many of the white miners who would pass by these placers in search of richer gold concentrations. Many of these working are found several hundred feet away from the current waterline, where gold bearing material from ancient river channels has been worked. There is definitely more potential in certain stretches of river than further downstream due to the abundance of lode gold sources feeding the placers, and historic mining operations were definitely much more concentrated in certain parts of the Columbia River than in many of the areas downstream. Get some good quality maps and seek out areas that indicate past mining activity. Placer gold will generally be found below the lode mines that produced gold. With the widespread nature of gold in the Columbia River, there is still good chances of finding small paystreaks that have not had much mining activity yet. As will many of the old placer diggings along the Columbia, the dams have raised the water level and covered many of the historic mining sites. Fine gold can still be found all along the banks of the river for a skilled and patient gold panner though. Very few of the early gold mining operations lasted for more than a few years. Gold concentrations are almost always difficult to find in paying quantities. This area is generally overlooked by most prospectors and for good reason. Time would most likely be better spent exploring the extensive opportunities in other gold districts. Nonetheless, there is some gold to find here in the Columbia River which may help to cure a bad case of “cabin fever”.